Members of the IAM Local 830 Negotiating Committee recently completed the Negotiation Preparation for Bargaining Committees Program at the William W. Winpisinger Center. 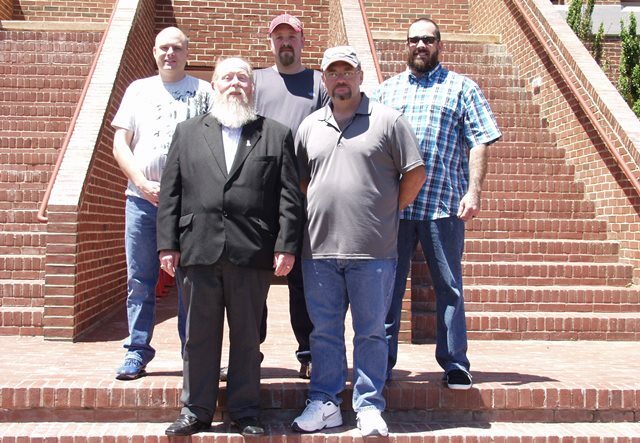 Back row, from left: Negotiating Committee members Daniel Brown, Jason Birkla, and Chief Steward Danny Lively. Front row, from left: District 27 Directing Business Representative Billy Stivers, Sr. and Negotiating Committee member Henry Green. The Negotiating Committee for IAM Local 830 in Louisville, KY, along with staff members from District 27, participated in the Negotiation Preparation for Bargaining Committees program at the William W. Winpisinger Education and Technology Center in Hollywood, MD. The local represents employees at BAE Systems, which manufactures weapons and armament systems, primarily for the U.S. Navy. The current contract with BAE expires August 19, 2016. Recognizing that this promises to be a difficult round of negotiations, the committee strategized to change bargaining history, map a new direction for relations with the company, obtain better contract language and build solidarity in the bargaining unit. As part of the program, the negotiating committee members are trained in drafting contract language, communications, strategic planning and legal issues. The training culminates in an all-too-real mock negotiation, using actual issues the committee will bring to the table. WWW staff members play the role of company negotiators.